Welcome to Elm City Music's Winter Flute Ensemble. This winter we will have one class beginning Monday January 7th. This class meets at 10:00 AM - 11:00 AM on Monday’s from January 7th through June 3rd. The class will give a performance at the Elm City Music Holiday Recital on June 8th. Please come and join us! The Elm City Music Flute Ensemble playing at our 2015 Fall Recital Ashokan Farewell by Jay Unger. Elm City Music's Flute Ensemble would like to wish everyone a Happy 2014 Holiday Season! The Elm City Music Flute Ensemble Performing at the 2013 Summer Concert & BBQ. 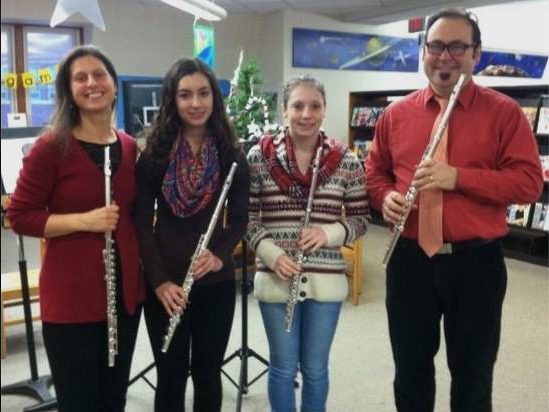 Elm City Music Flute Ensemble at the Keene Public Library on our 2013 Holiday Tour. The Elm City Music Flute Ensemble Performing at the 2014 Summer Concert & BBQ.